This is an easy but very useful recycled water bottle craft. I have a special notebook, where I glue down or write down my recipes. But some recipes I use lots of times during a month. It’s so easy to spill things over a recipe you use often and pages get torn or spotted. You should use transparent plastic bottles, if you want two sided recipe frames made out of them. I just cut out two pieces of plastic out of a water bottle for each recipe frame. Then I make holes on the edges. You may use a pricker or hot nail for this purpose. Then I used recycled yarn to crochet the frames on three sides. One side you leave to insert the recipe through. 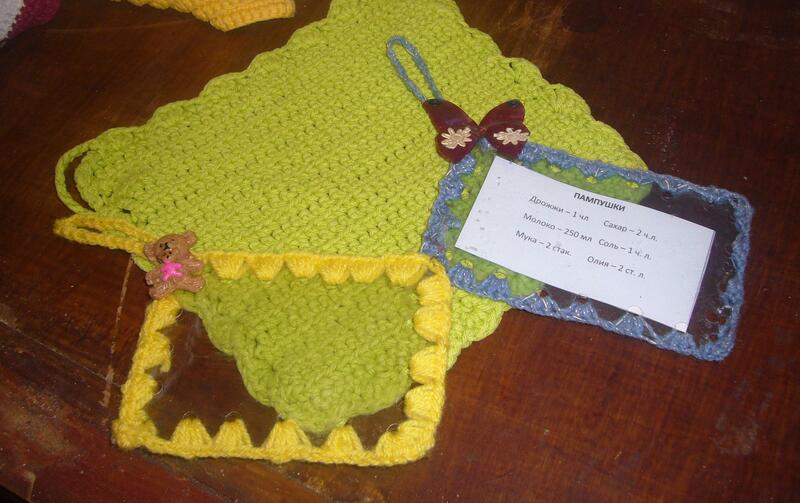 I have made three crochets into each hole, while crocheting the frame over. Then I crocheted a loop to hang those recycled water bottle frames by. I have printed out my recipes on both sides of paper and inserted them into the frames. This way, you get your recipes at hand at all times and they are protected from dirt or water. I have used hot glue to put on decorating items onto my plastic bottle recipe frames. This is a great way to go green, to organize your kitchen stuff and to craft something very useful. You can make a dozen or so of these recycled recipe frames. They look real cute at the kitchen. 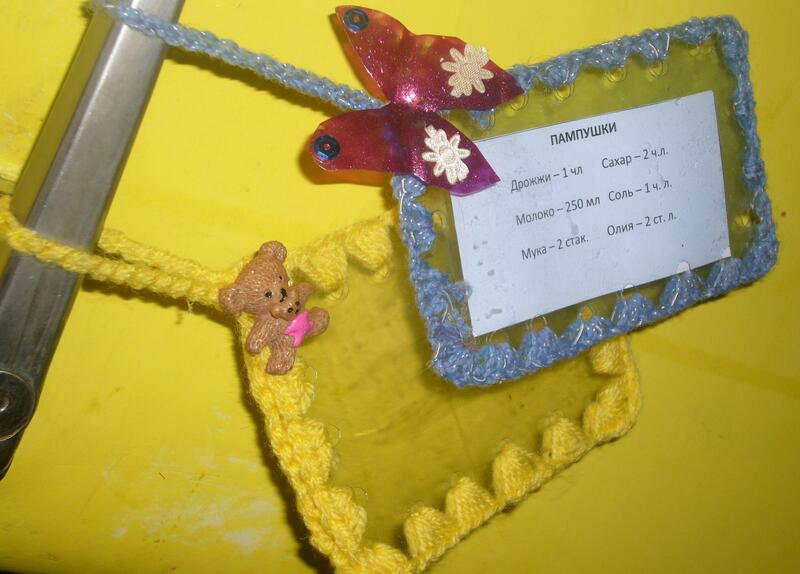 This entry was posted in Crafting Tutorials, Go green and tagged crafts, crochet crafts, crocheting, DIY, diy recipe frames, go green, green crafts, kitchen crafts, organizing kitchen, plastic bottle crafts, recipe frames, recipe holders, water bottle crafts, water bottle recycling, yarn. Bookmark the permalink.